Computed Tomography (CT) imaging is also known as "CAT scanning"(Computed Axial Tomography). Computed Tomography is based on the x-ray principal: as x-rays pass through the body they are absorbed or attenuated (weakened) at differing levels creating a matrix or profile of x-ray beams of different strength. This x-ray profile is registered on film, thus creating an image. In the case of CT, the film is replaced by a banana shaped detector which measures the x-ray profile. A CT scanner looks like a big, square doughnut. The patient aperture (opening) is 60 cm to 70 cm (24" to 28") in diameter. Inside the covers of the CT scanner is a rotating frame which has an x-ray tube mounted on one side and the banana shaped detector mounted on the opposite side. A fan beam of x-ray is created as the rotating frame spins the x-ray tube and detector around the patient. Each time the x-ray tube and detector make a 360° rotation, an image or "slice" has been acquired. This "slice" is collimated (focused) to a thickness between 1 mm and 10 mm using lead shutters in front of the x-ray tube and x-ray detector. As the x-ray tube and detector make this 360° rotation, the detector takes numerous snapshots (called profiles) of the attenuated x-ray beam. Typically, in one 360° lap, about 1,000 profiles are sampled. Each profile is subdivided spatially (divided into partitions) by the detectors and fed into about 700 individual channels. Each profile is then backwards reconstructed (or "back projected") by a dedicated computer into a two-dimensional image of the "slice" that was scanned. In all original CT scanners (1974 to 1987), the x-ray power was transferred to the x-ray tube using high voltage cables wrapped around an elaborate set of rotating drums and pulleys. The rotating frame (or gantry) would spin 360° in one direction and make an image (or a slice), and then spin 360° back in the other direction to make a second slice. In between each slice, the gantry would come to a complete stop and then reverse directions while the patient table would be moved forward by an increment equal to the slice thickness. In the mid 1980's, an innovation called the power slip ring was developed so that the elaborate x-ray cable and drum system could be abandoned. The slip ring allows electric power to be transferred from a stationary power source onto the continuously rotating gantry. State-of-the-art CT scanners with slip rings can now rotate continuously and do not have to slow down to start and stop. The innovation of the power slip ring has created a renaissance in CT called spiral or helical scanning. These spiral CT scanners can now image entire anatomic regions like the lungs in a quick 20 to 30 second breath hold. Instead of acquiring a stack of individual slices which may be misaligned due to slight patient motion or breathing (and lung/abdomen motion) in between each slice acquisition, spiral CT acquires a volume of data with the patient anatomy all in one position. This volume data set can then be computer-reconstructed to provide three-dimensional pictures of complex blood vessels like the renal arteries or aorta. 3D CT images from volume data allow surgeons to visualize complex fractures, for example of facial trauma, in three dimensions and can help them plan reconstructive surgery. New "multi-slice" spiral CT scanners can collect multiple slices of data during spiral CT mode and rotate at faster speeds. These systems can collect more data than previous state-of-the-art spiral CT systems that rotate at slower speeds and only collect one slice of data at a time. Multi-slice CT scanning allows non-invasive imaging and diagnosis of wider range of conditions in less time and with greater patient comfort. The combination of multi-slice CT and new 3D reconstruction promises to allow veterinarians to see even more than ever before. Multi-slice CT systems are at "the cutting edge" in terms of speed, patient comfort, and resolution. CT exams are now quicker and more patient friendly than ever before. As CT scan times have gotten faster, more anatomy can be scanned in less time. Faster scanning helps to eliminate artifacts from patient motion such as breathing or peristalsis. The latest technology in CT scanners includes a technique for improving CT guided biopsies. 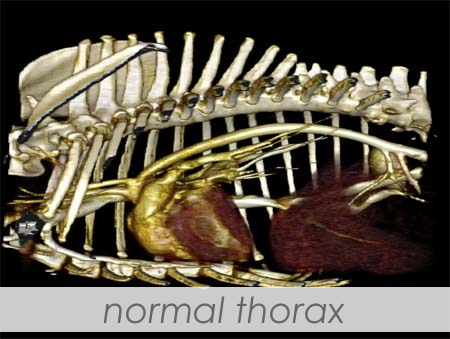 Three dimensional volume rendering of a CT scan of a normal chest (thorax) in a dog. 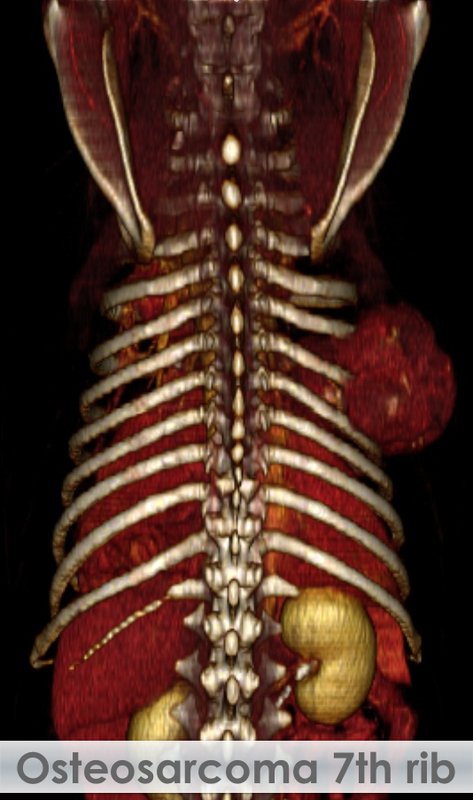 3 Dimensional volume reconstruction showing an osteosarcoma originating from the 7th rib on the right. 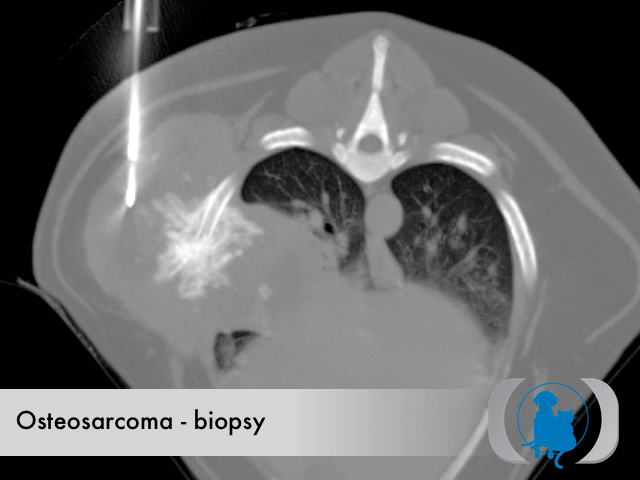 CT guided biopsy of osteosarcoma originating from the 7th rib on the right.